A musical summer. That’s what I’m having. A time to renew friendships, too. I’m back in the studio and excited to tell what’s been happening! Since making the 12-foot-long lei for the Pacific Cup yachts—I went for the third time to sing and conduct with Prof. Rod Eichenberger in Cannon Beach, Oregon, a pilgrimage made by at least a hundred choir directors and music educators from all over the globe every summer. For me, and apparently many others, it is addicting to learn from the master, who has taught his tried-and-true method for 60 years. Each year he also shares what he learned the earlier 12 months. 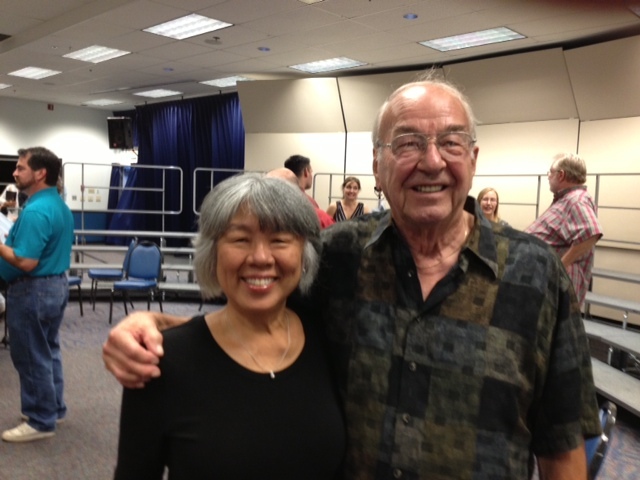 He teaches how to get a good sound out of a choir, how to save rehearsal time, and how to manage a choir. Five days, almost 200 pieces of new music from publishers to sight-read, 20 “student” conductors—some already are extremely accomplished, wow! so very humbling—and a public concert on the fifth night. I am sort of misfit, neither an active choir director nor music educator, although I have done some of it. Love working on my skills. Of course, by way of introduction, folks ask, “What do you do?” I’m a choral singer! It was fun to see familiar faces and to talk about the music culture. Everyone is so busy during the academic year. Summer is a great time to catch up. It’s like a retreat or music camp in a resort venue. Next year’s Choral Conductors Workshop is already scheduled for the last week of July 2015. Interested? While in Oregon I visited with Jon and my hanai sister Margaret in Tualatin who graciously loaned me their van to drive to the beach, and who took care of me when I returned after the workshop with no speaking voice. I think it was a “bug” I picked up on the plane. I love Facebook. A new friend, Kasey who lives nearby, posted a call for singers to join the noted 12-member Hawaiian choir Kawaiolaonāpūkanileo this season. The director calls it “project-based singing.” I asked to join and was accepted! 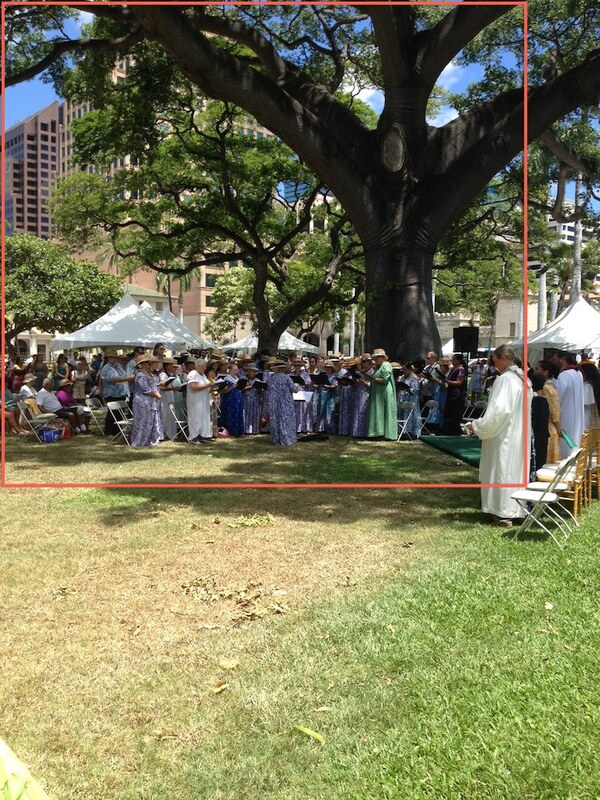 The first event is “Onipa‘a,” at 11 a.m., on Sunday, Aug. 31, at ‘Iolani Palace, Honolulu, celebrating Queen Lili‘uokalani’s birthday. We are singing her compositions as well as some songs written about/for her. These are in the Hawaiian language, and we are singing all the verses! So thankful I practiced with Rod last month. 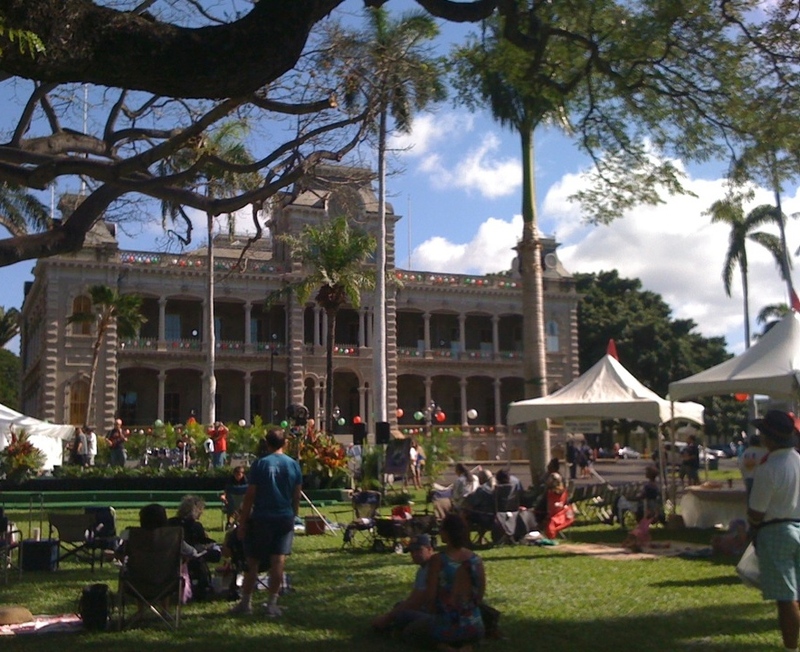 The second project is “‘Emalani II,” a Hawaiian opera: two performances—3 p.m. and 6 p.m. on Saturday, Nov. 15, at St. Andrew’s Cathedral, Honolulu. Other choirs have roles, too. Understandably, one has to commit to all the rehearsals. Luckily, there are none in September, so I can go with DH to Pennsylvania for his high school reunion, to visit his family there, and to call on our friends in Massachusetts. Road trip! My high school alumni glee club resumes rehearsing after the summer break, too. It will be great to sing and perform with the gang. I love music!